I’m going to say this right now, I love Twig and Tale patterns. I own many but have only sewn a few, (story of my life!) but the ones I have made have been absolutely perfect. I’m not affiliated with Twig and Tale in anyway, and I have not been paid for my opinion. I have sewn the Tie Back Boots before, and absolutely loved them. The Tie Back Boots print out perfectly, and the pages go together like peas and carrots. The grading is logical and even amongst all sizes. The pattern uses trim pages, which I love. I always feel like no trim pages don’t come together as precisely. There are borders printed on all four sides, and little circles to create in each corner. Perfect. All pattern pieces are cut on the fold. The pattern feature layers and the ⅜ seam allowance is printed on each pattern piece as well as referred to in the pattern. The instructions are designed not to be printed. ‘Quick links’ are used for ease of navigation throughout the pattern. You can jump from page to page by clicking on either a green word, or by using one of the quick links and at the bottom of each instruction page. For example, imagine you are reading over the instructions when decide to check what size you need. Hover over the ‘size guide’ option at the bottom of the page, click it, and you’re there. No scrolling for an eternity! 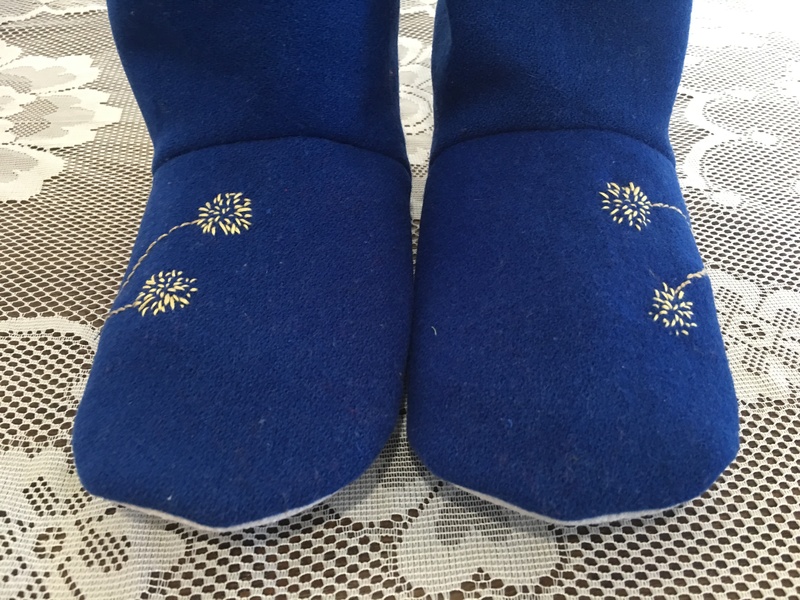 The adult patterns covers women’s size five to twelve (21.6cm to 27.6cm) and men’s size 8.5 to 15 (25.9cm to 31cm). My foot measured 23cm which put me in a size seven. I typically wear a nine, but I went with the pattern and did the seven. The fit was perfect. 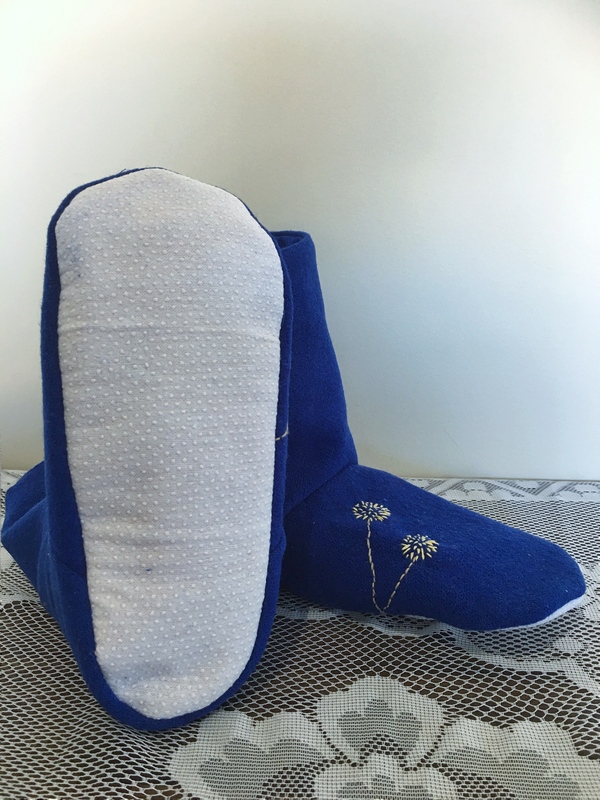 There is a great guide to upcycling in each Twig and Tale pattern, and the Tie Back Boots are no exception. Wool blankets are amongst the fabrics suggested and I found a lovely blue Onkaparinga blanket labelled ‘dog bed’ at my local opshop. It was worth the risk, it had a few minor flaws but otherwise there was heaps of usable fabric. The pattern also suggested using old leather garments for the soles. I chose to use the birch non slip fabric from spotlight, because that’s what I had on hand. If you do use the birch non slip fabric, make sure you sew it grippy side to feed dogs. There are also suggestions for embroidery in the pattern. 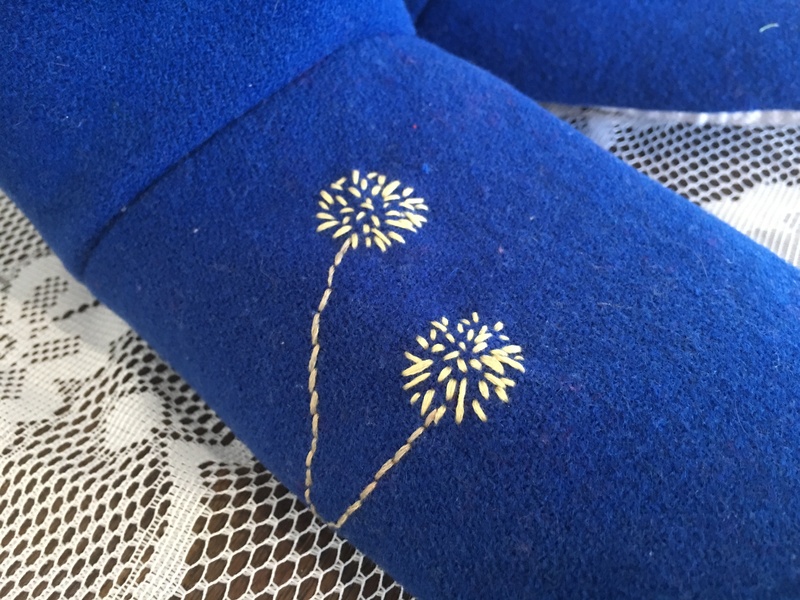 I grabbed the embroidery file and stitched some sweet dandelions on my toe pieces. I’ve never done embroidery before so they’re not perfect, but cute enough for me! 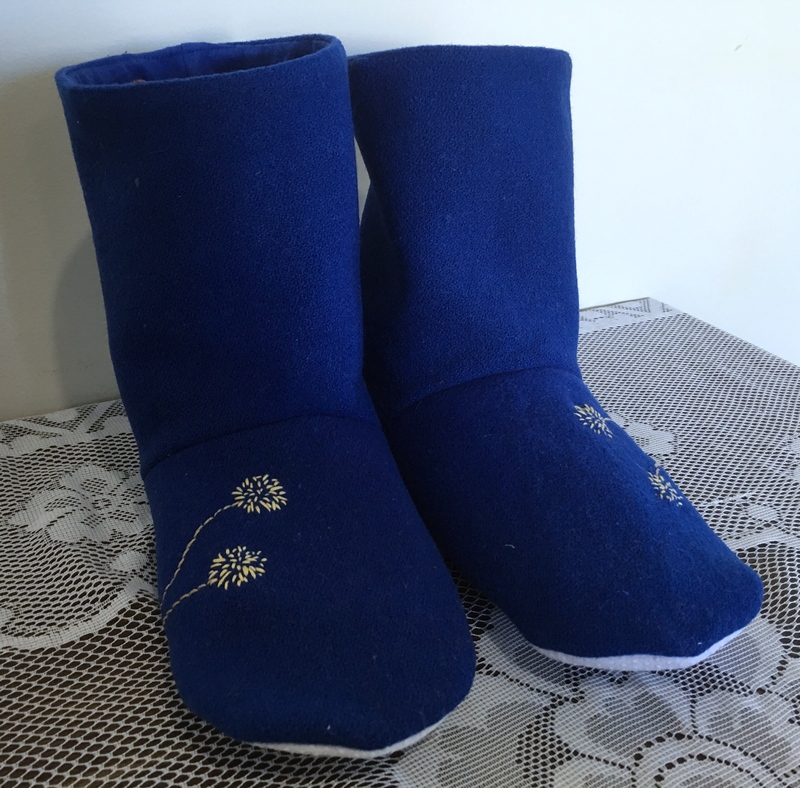 This pattern has options for both external and internal elastic, as well as regular and tall heel height. I choose the internal option and the regular height. The instructions are great, they’re not too wordy and there’s heaps of very useful pictures. 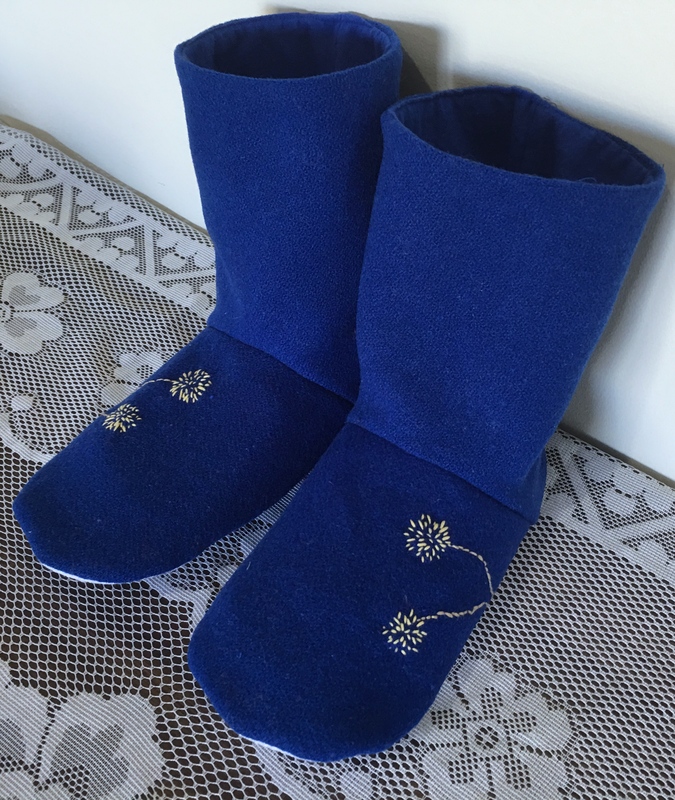 The pattern even includes a link to a video tutorial. I think this project is suitable for a beginner with a few projects under their belt.